LET THE GRILLING SEASON BEGIN! 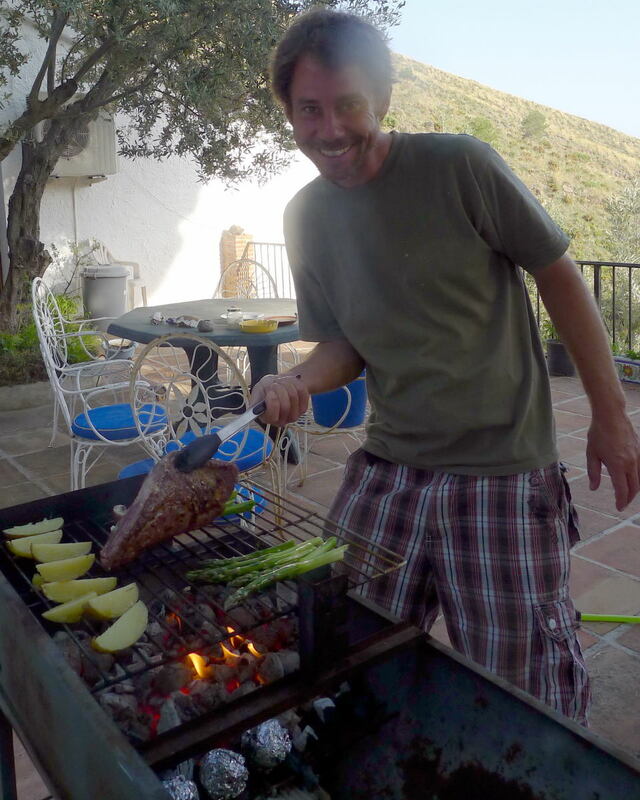 I missed the “official opening” of the grilling season (Memorial Day is not a holiday in Spain), so I’m opening the season this week, celebrating the arrival of a new (used) charcoal/wood grill. 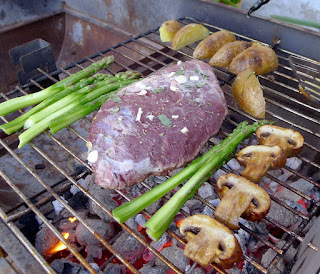 Ben grills ibérico pork, asparagus, potatoes and mushrooms over charcoal. At the supermarket I got a big hunk of Ibérico pork, fresh asparagus and a bag of charcoal. I had on hand onions and potatoes newly dug from the garden. 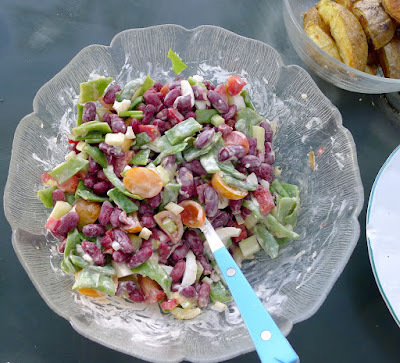 To complete the menu I made a two-bean salad with green beans from the garden and a jar of kidney beans. Ibérico pork is raised to make the famed Ibérico hams and cured shoulders. 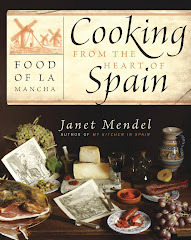 Some of the other cuts are used for various kinds of sausages (chorizo, morcilla, salchichón, lomo, morcón). The remainder is marketed as fresh pork. Ibérico pork, fresh and cured, comes from animals of the Ibérico breed. What distinguishes this breed from regular porkers (such as Large White, Landrace and Duroc) is that they are very slow to mature, never reaching the size of hogs destined to be pork chops. The Ibérico breed, as it adapted to its habitat, acquired the unique characteristic of storing fat infiltrated in the flesh. The marbled meat is what makes it so juicy, the perfect meat for grilling. 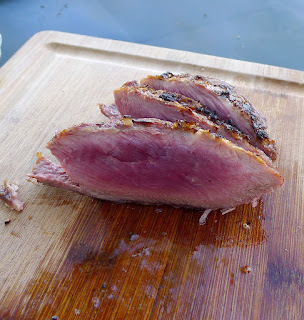 The cut I bought was the presa, a thick, boneless slab from the shoulder, weighing about 1 ½ pounds. Even though this is not de bellota—acorn finished—it is naturally marbled with fat. It stays juicy and tender, so doesn’t need brining. Cut of ibérico pork called presa, rubbed with garlic and herbs. I chose to give the piece of meat a rub of chopped garlic, thyme, rosemary, sage, salt and a spoonful of vinegar and allow it to set at room temperature for one hour. 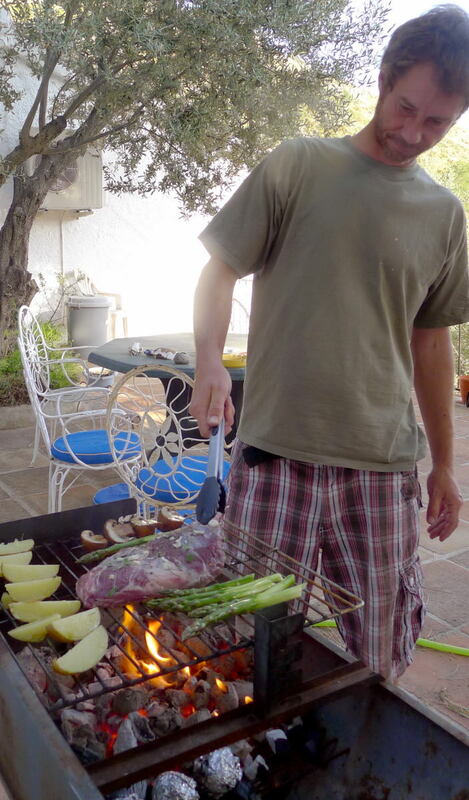 Son Ben was the grill master—he’s had lots of experience. 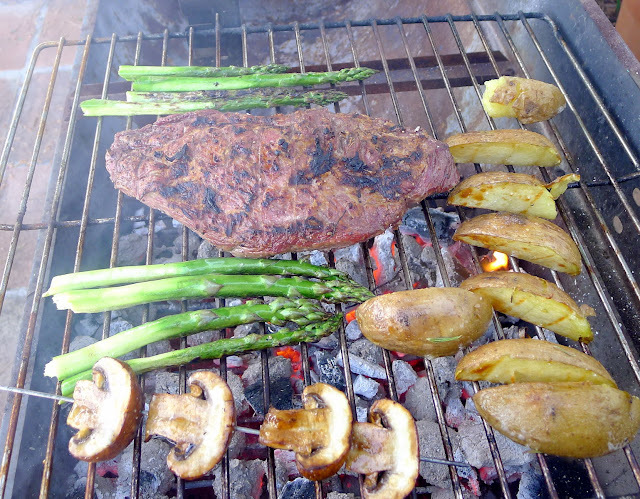 We tucked foil-wrapped onions into the embers, placed asparagus, par-boiled potatoes and mushrooms right on the grill with the meat. Ready to flip the meat? Note foil-wrapped whole onions are roasted in the embers under the grill. Smoke, the added flavor. Next time, we'll try an olive-wood fire instead of using charcoal. 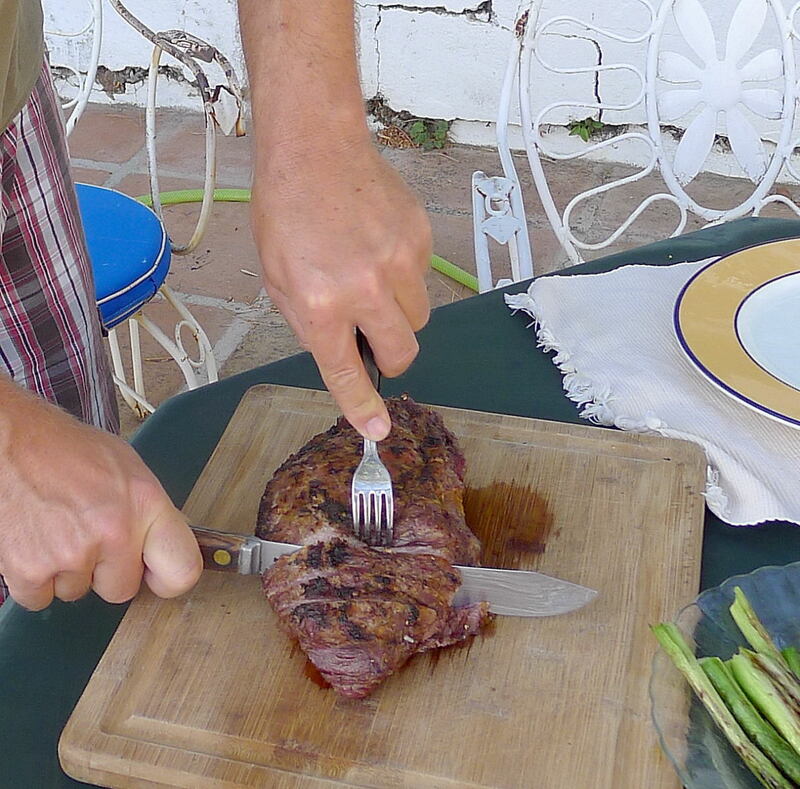 Let meat set 5 minutes before carving. Serve ibérico pork medium rare, like beef. We decided this was a little too bloody. After carving off the ends, we put it back on the grill for another few minutes. Salad on the side--green beans from the garden, red kidney beans, cherry tomatoes, chopped onions with an olive oil-yogurt dressing. Some sauces that would go nicely with the pork and potatoes: Fig Salsa, Quince Sauce, Green Chile Sauce. Fresh ibérico pork cuts are available in the US from http://www.wagshalsimports.com/ and http://www.tienda.com/food/iberico-meat.html . 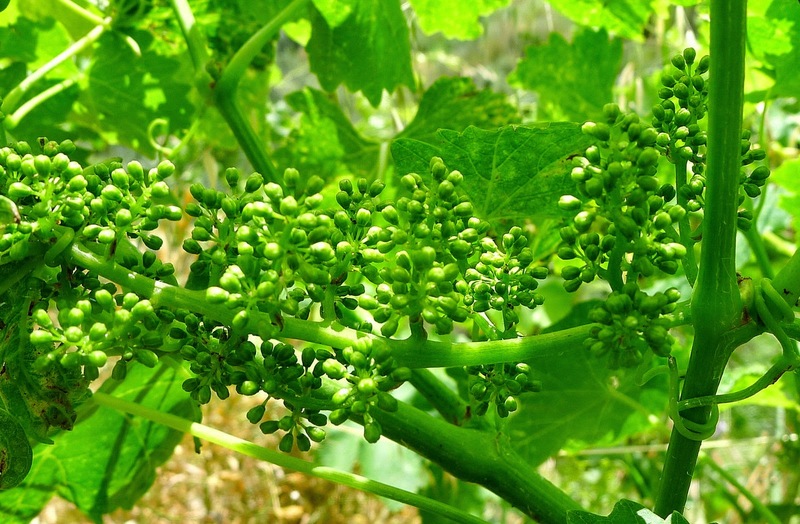 Having inspected the grape vines on the terraced hillside, Fran, my gardener, announced it was time to prune them, “en verde,“ when the first bunches of grapes have appeared. He showed me the infant grapes and said the non fruit-bearing stems should be cut back, so all the vine’s energy goes into making fat grapes. Then, he said, it’s time to spray the vines against mildew. 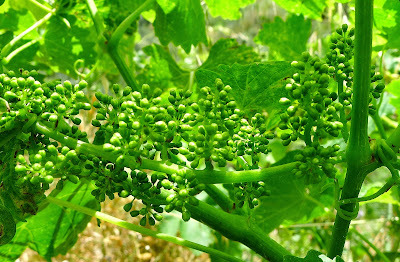 Bunches of tiny grapes appear on the vines. I asked Fran to bring me all the pruned leaves, before spraying. “What for?” he asked. 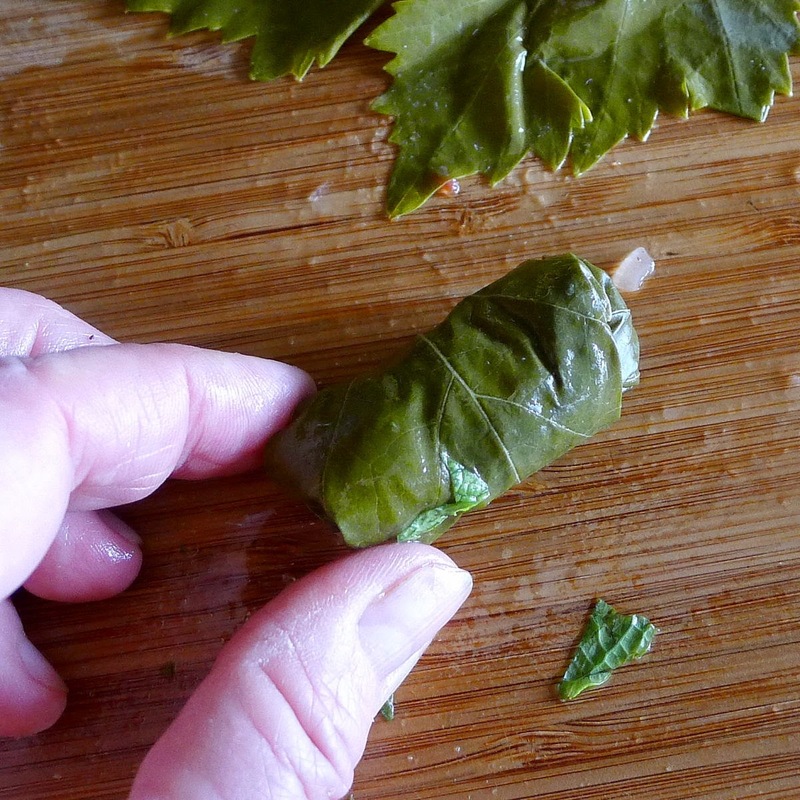 To make stuffed grape leaves, I told him. Here in southern Spain, this is unheard of. But I’ve been using vine leaves from the arbor ever since I first found a recipe for them in A Book of Middle Eastern Food by Claudia Roden (I have a 1972 Penguin edition). 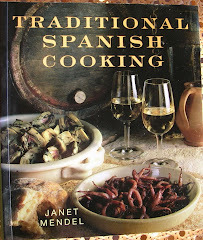 I usually make the version from that book with minced lamb and rice in the stuffing. 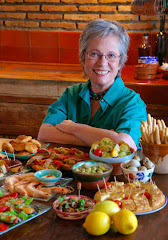 But this time I found a recipe in Paula Wolfert’s Mediterranean Clay Pot Cooking (John Wiley, 2009) without meat, calling for rose petals mixed into the rice stuffing. I grabbed some of the fragrant petals before Fran got to them with the spray. 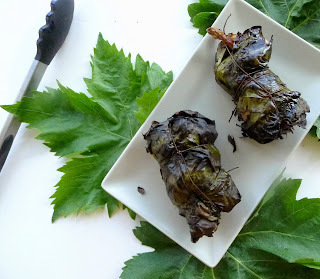 Grape leaves do appear in Spanish cooking as a wrap for food to be cooked over a wood fire. Vineyard workers, hunters, wayfarers on the Camino de Santiago, might snare wild birds or fish, wrap them with ham fat and vine leaves and grill them for a tasty meal. 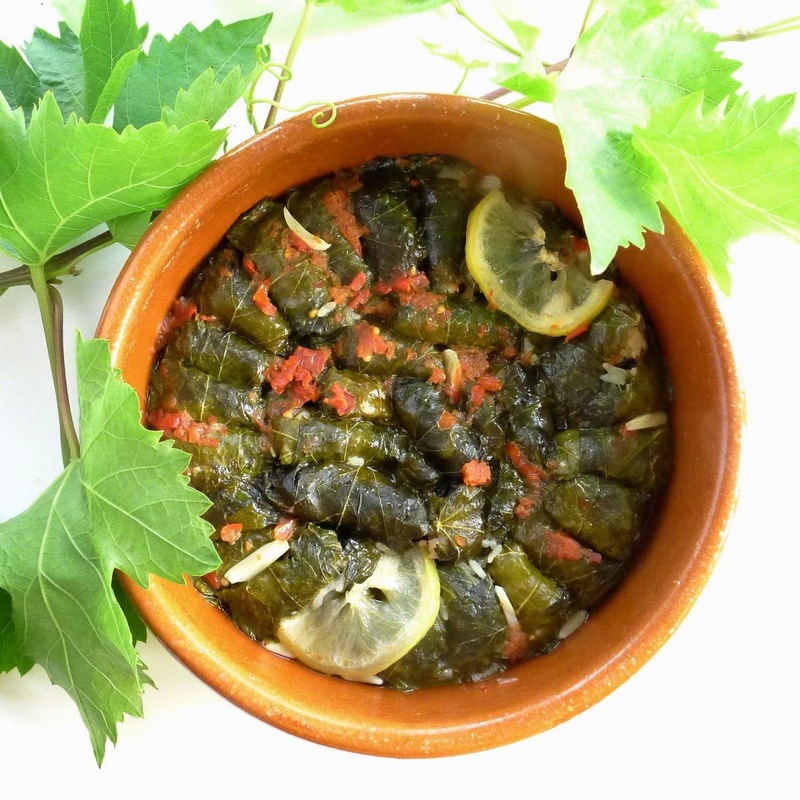 The grape leaves are not meant to be eaten; they flavor the food and protect it from the embers. 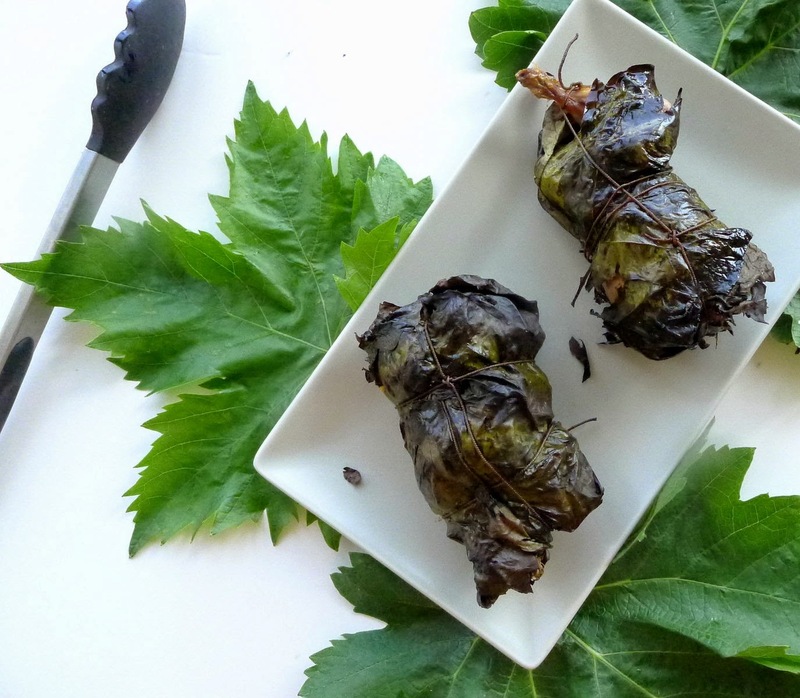 Grape leaves have a lemony, citric flavor. I’ve used them, shredded, as a substitute for lemongrass in Southeast Asian recipes. I also use them as a pan-liner for oven-roasted chicken or fish. 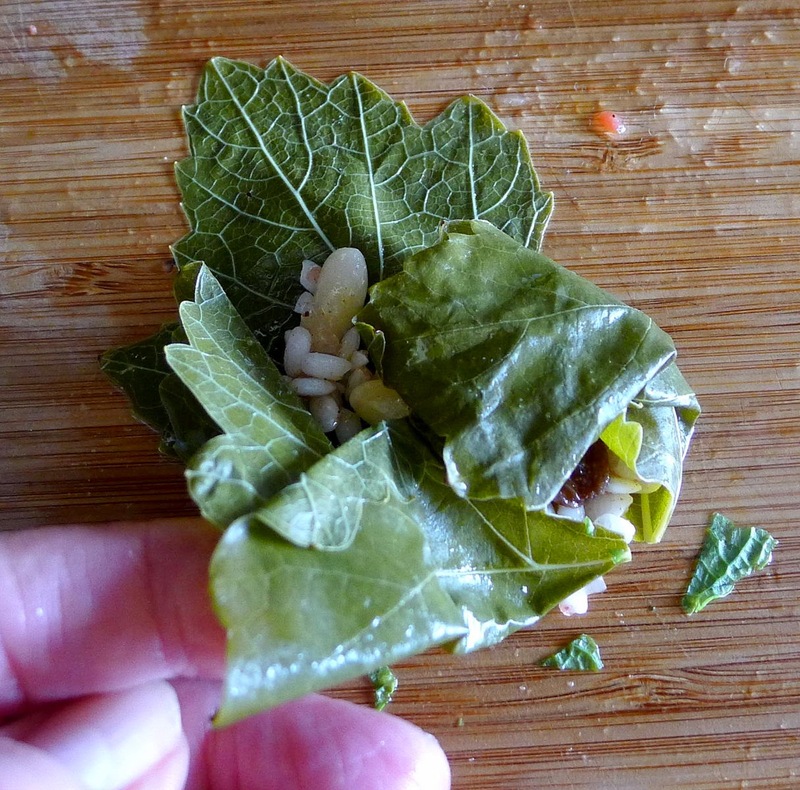 Vine leaves enclose a stuffing of rice, raisins and pine nuts. Stuffed quail, wrapped in grape leaves, ready for the grill. 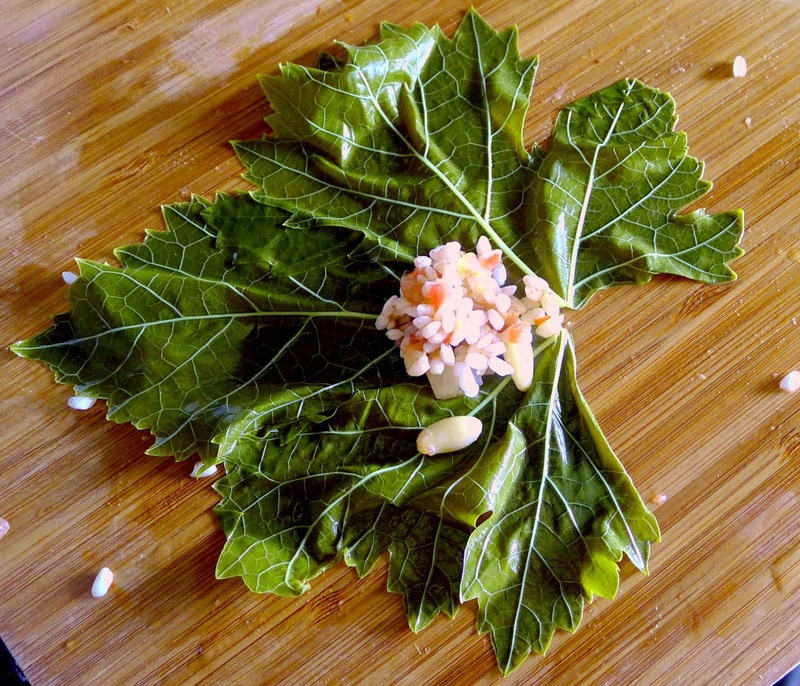 Stuffed vine leaves are cooked with garlic, lemon, tomato. If you don’t have a grape arbor to provide (unsprayed) leaves, use the ones packed in brine from a Greek or Middle Eastern grocery. Wash the leaves. Blanch them in boiling water for 1 minute. Drain and cool. Place the rice in a heatproof bowl. Pour the boiling water over it and allow to stand for 10 minutes. Drain the rice and place in a bowl. Add 2 tablespoons of the oil, onion, pine nuts, raisins, chopped mint, parsley, ½ teaspoon salt, freshly ground pepper, cinnamon, allspice and rose petals, if using. Mix well. Working with one leaf at a time, spread it out, shiny side down, on work surface. Nip out the stem and discard. Place a scant teaspoon of the rice mixture at the stem end of the leaf. Fold up the bottom, fold over the side lobes, then roll the leaf up like a cigar. 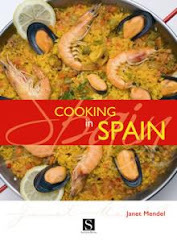 Line a small pan or cazuela with slices of lemon. Drizzle with remaining tablespoon of oil. Place the grape leaves as they are rolled, seam-side down, in the pan. Pack them in as tightly as possible. Tuck slivers of garlic between the rolls. Add any remaining lemon slices and the sliced tomato. Add water to just cover the rolls, about 1 cup. Place a heat-proof saucer on top of the grape leaves to prevent their bobbing up in the water. 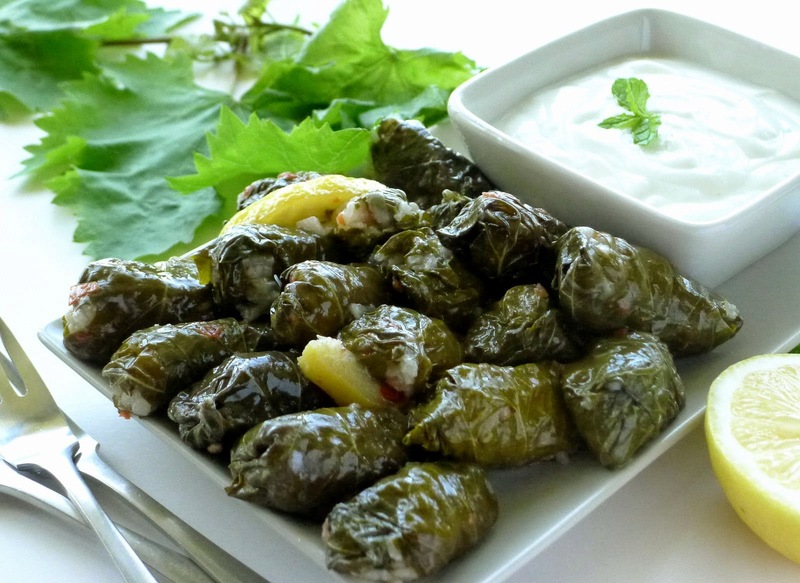 Bring the liquid to a boil, then reduce heat to minimum and cook until grape leaves are tender and rice is cooked, about 25 minutes.. Remove the saucer. Remove from the heat and allow to cool in the pan. Invert the pan onto a plate, pouring off any remaining liquid. Serve the grape leaves room temperature or chilled, accompanied by a sauce of Greek yogurt mixed with chopped mint, crushed garlic and salt. 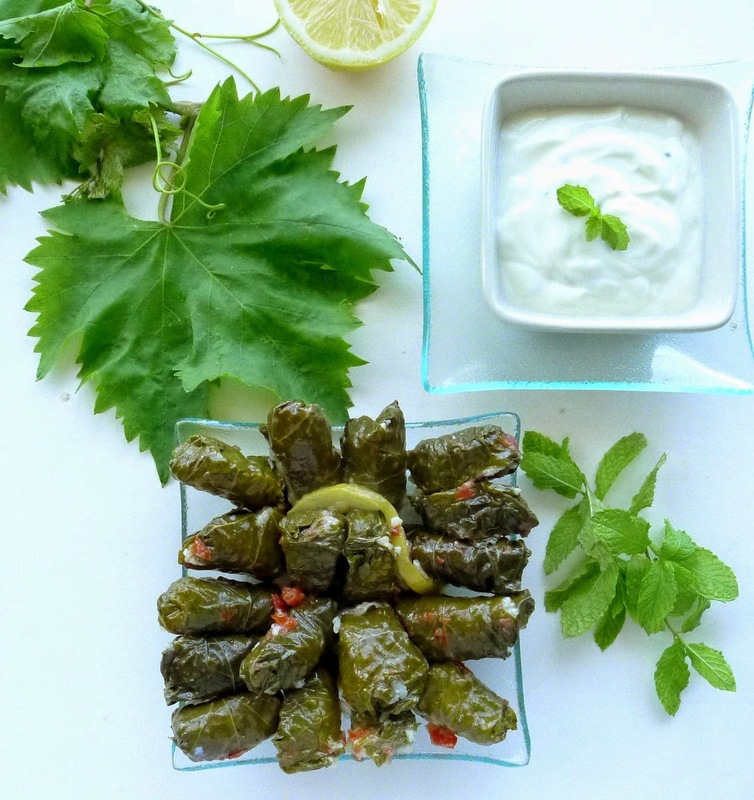 Vine leaves with yogurt-mint sauce. 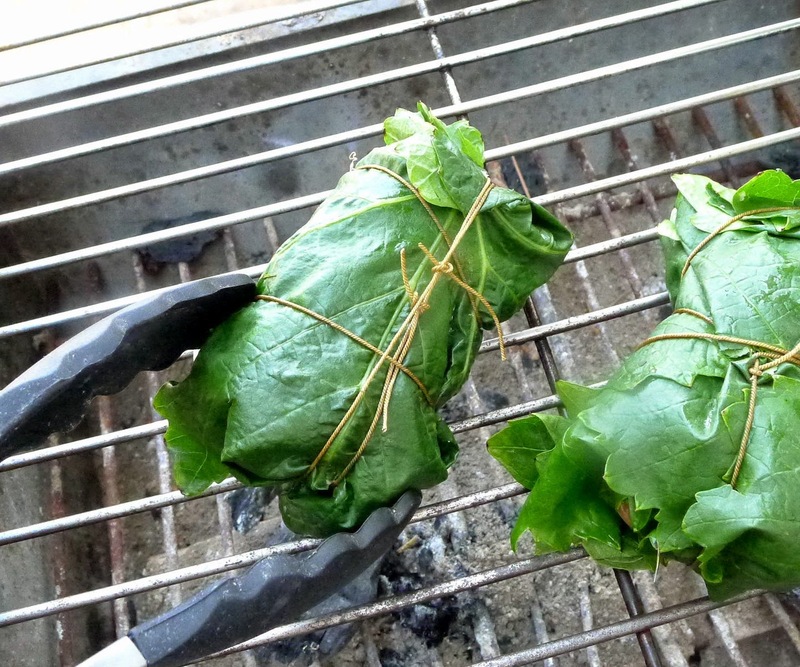 Grilled quail wrapped in vine leaves. Quail are farm-raised, not wild. Serve one quail per person as a starter or tapa, but allow two or three for each if they are to be a main course. 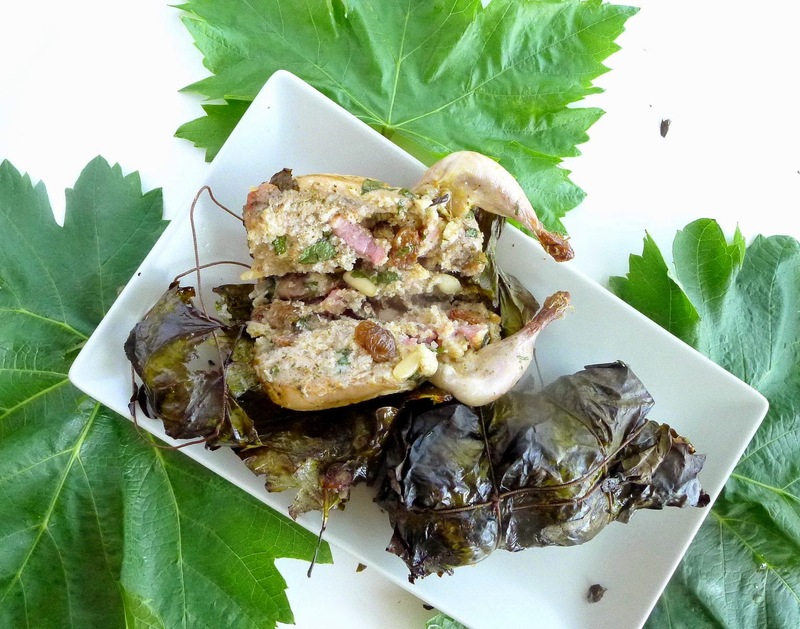 Use large vine leaves to wrap the quail. The leaves don’t need to be blanched, although blanching makes it easier to wrap the birds. Use kitchen twine to secure the leaves around the quail. Vine leaves to wrap, raisins in the stuffing and, to follow the grape-y theme, a glass of wine with the quail. A fruity Tempranillo red or Verdejo white would complement the quail. This is campfire food. Use your fingers to eat the quail! Split the quail open through the breast bone and spread them open. Place in a non-reactive container. Sprinkle with salt and pepper, thyme and lemon juice. Add 1 tablespoon of the olive oil. Allow the quail to marinate at room temperature for 30 minutes or, covered and refrigerated, up to 24 hours. In a small bowl combine the breadcrumbs, raisins, bacon, pine nuts and parsley. Add the remaining 1 tablespoon of oil and salt and pepper. Open up the quail on a work surface. Place a spoonful of the breadcrumb stuffing on each. Close the quail. 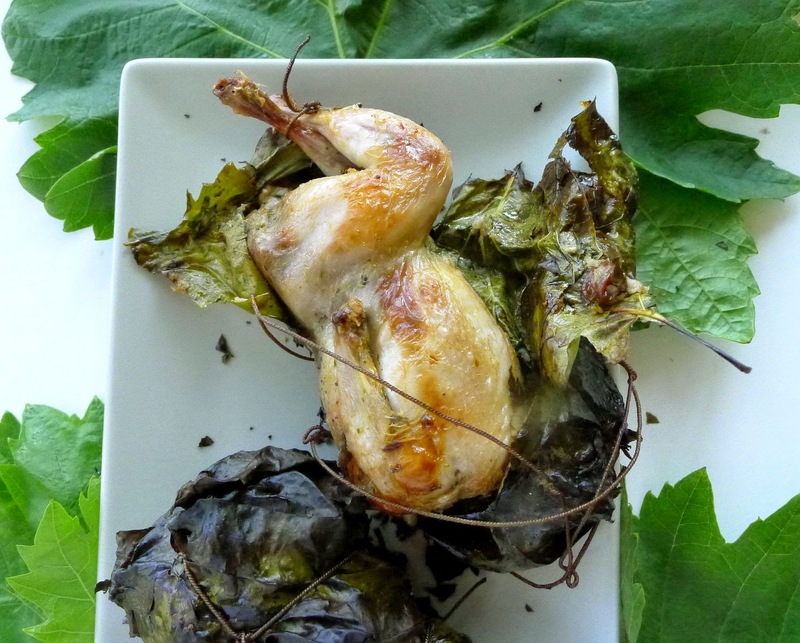 Use 2 grape leaves to wrap each quail, tying them with twine to make packets. If grilling the quail, start charcoal burning. When coals are hot, place quail on grill at lowest position. Grill 10-15 minutes; turn the quail and grill another 10 minutes. To oven-roast the quail: preheat oven to 425ºF. Place the wrapped quail on a rack. Roast 15 minutes, turn them and roast 10 minutes more. Stuffed quail are grilled to perfection. If you never thought of pine nuts beyond the ubiquitous pesto sauce, it’s time to take a fresh look at this little nut. 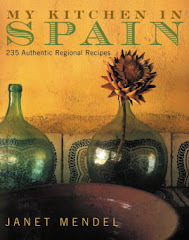 In Spanish cooking it appears everywhere that this variety of pine tree grows, from the Marismas of the Guadalquivir (Sevilla) to the upland regions of Murcia and Valencia. 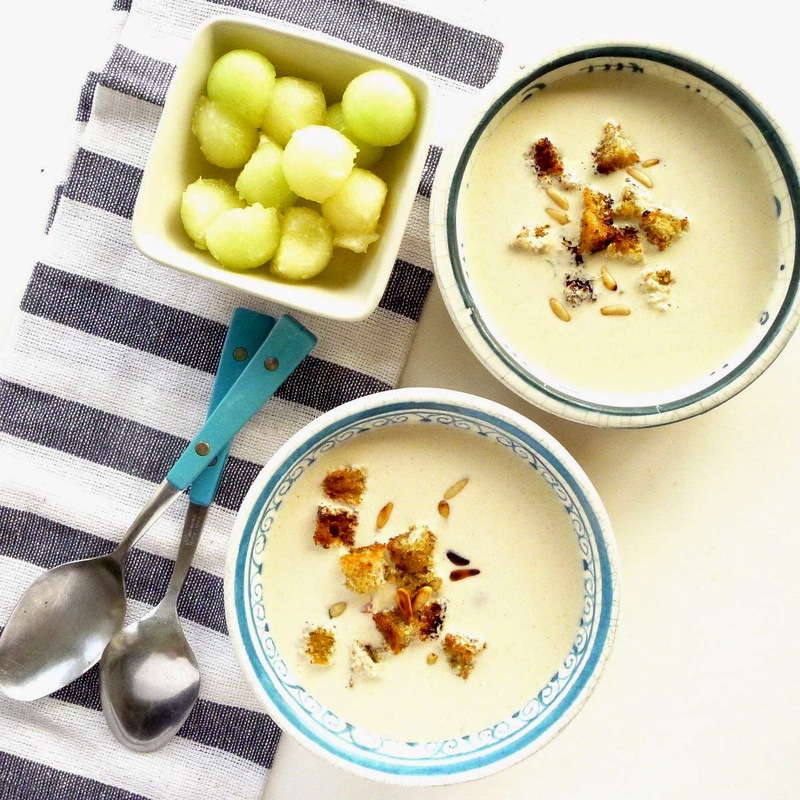 White gazpacho with pine nuts. Serve it with melon balls and crisp croutons. Several Mediterranean stone pines tower over my terrace. As the weather warms, the pine cones on the trees open and drop the pine nuts onto the terrace. I’ve been collecting them in a bowl, waiting to get a sufficient quantity to crack them and extract the tiny kernels to use in cooking. But then, in one fell swoop, all the pine nuts disappeared! No chipmunk or squirrel at work here; I think my grandson snacked on the cache of pine nuts one afternoon! I didn’t really fancy cracking them, anyway. So tiny, they are tedious to open without breaking the delicate little nuts. 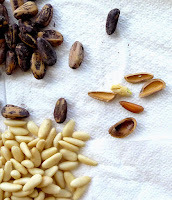 Instead I bought pine nuts from the “nut lady” at the market, choosing the expensive Mediterranean pine nuts over the smaller and cheaper imported Chinese ones. In traditional cooking, a handful of pine nuts goes into the stuffing mixture for chicken or turkey, into meatballs, added to lamb or rabbit stew, with a sauté of chard or cauliflower. They are used in sweets too. Mashed to a paste, pine nuts flavour sauces, soups and gazpachos. 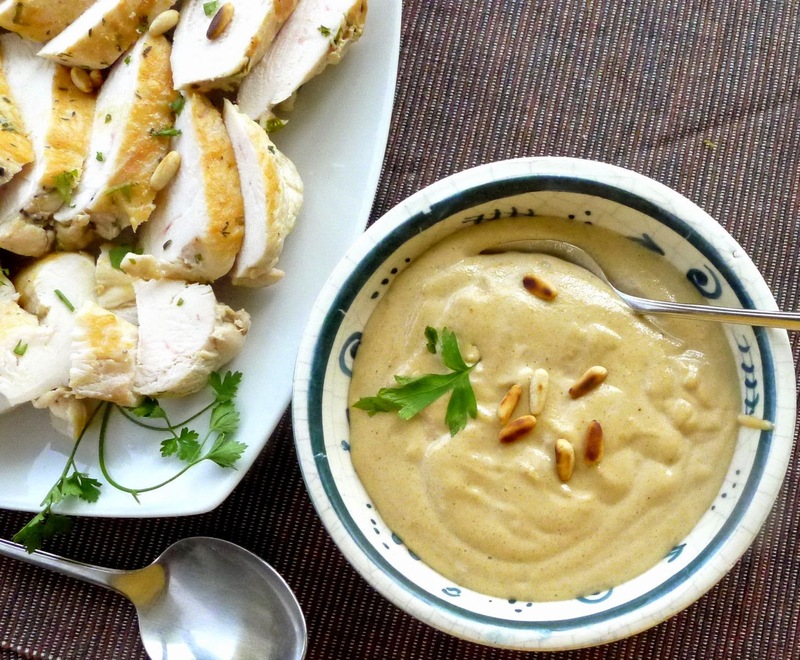 Garlicky pine nut sauce goes with sauteed chicken. This no-cook sauce starts out like pesto, by grinding together pine nuts, garlic and olive oil. But without the basil and cheese, it winds up tasting more like tahina (sesame) sauce. It’s wonderful on poultry, fish, vegetables, even pasta. While parsely is the traditional herb, use basil if you like. 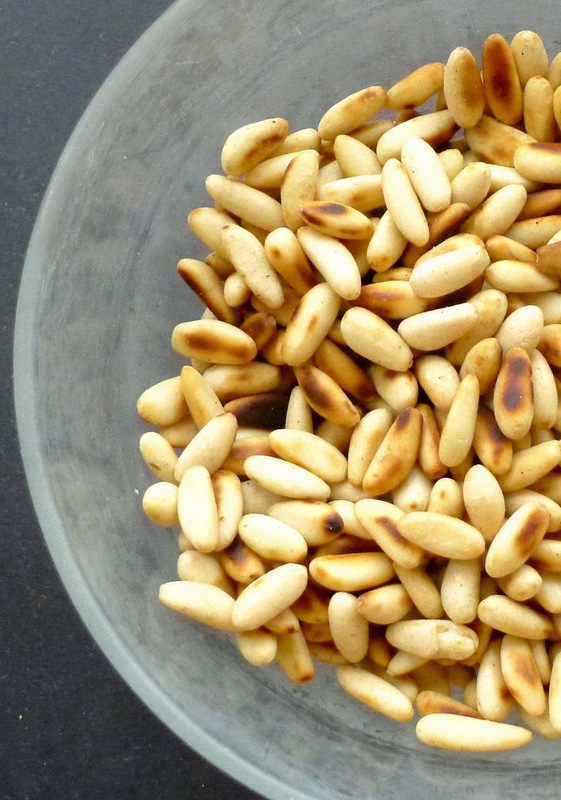 The pine nuts can be used straight, but toasting them first gives an extra dimension of flavour. This is such a quick and easy dish. 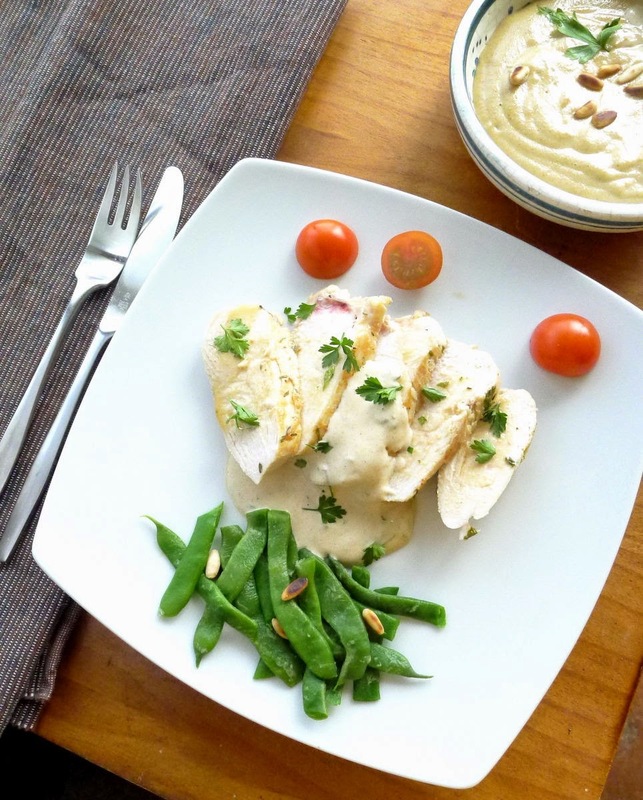 The chicken breasts are marinated and sautéed, then served with the rich pine nut sauce. The sauce doesn’t need cooking, so serve it at room temperature. The chicken can be cooked in advance and served hot or cold. Place 1 teaspoon of the oil in a small skillet. 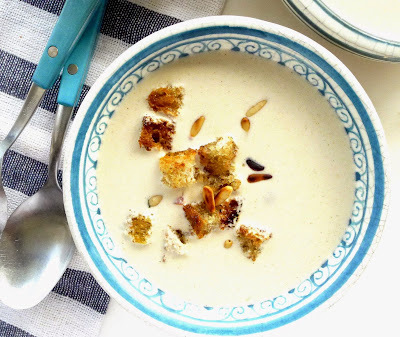 Add the pine nuts and toast them, stirring frequently, until they are lightly browned. Remove and let them cool. In blender or food processor purée the pine nuts and garlic, adding some of the water, as needed. Beat in the oil, lemon juice and remaining water. Season with salt and pepper. Stir in the chopped parsley immediately before serving. Serve at room temperature. Remove the tenders from the chicken breasts and save them for another use. Place each of the breasts between plastic wrap and pound it to flatten slightly. Place the breasts in a bowl and sprinkle with salt and pepper. Add the chopped parsley, thyme, wine and 1 tablespoons of the oil. Cover and marinate the chicken for at least 30 minutes or, refrigerated, up to 12 hours. Pat the chicken breasts dry. Reserve the marinade. Heat the remaining 2 tablespoons of oil in a heavy skillet until very hot. Add the chicken breasts and cook, without turning, until browned, 3 minutes. Turn them and brown the other side, 3 minutes. Pour over the reserved marinade. Cook, covered, on a medium heat, turning once until chicken is cooked through, about 5 minutes. Remove from the pan and pour over the cooking liquid. Allow to set 5 minutes before slicing the breasts. Serve hot, room temperature or cold accompanied by the pine nut sauce. Spoon pine nut sauce over chicken and vegetables. A version of gazpacho, made with pine nuts. 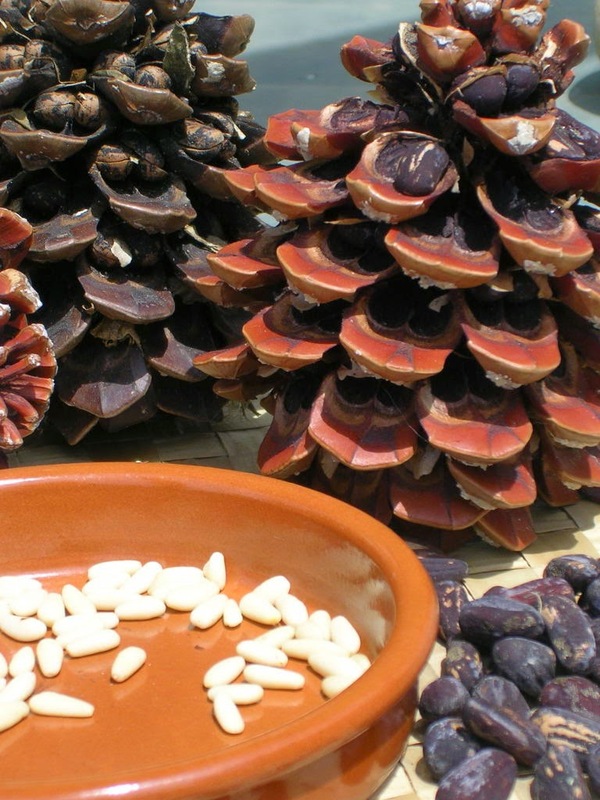 Where pine trees grow, such as in the marismas, marshlands, of the Guadalquivir River basin, pine nuts might be used instead of almonds for white gazpacho. The eggs in this recipe give the gazpacho a silky texture. Soak the bread crumbs in water to cover until softened. Grind the pine-nuts and garlic in a food processor. Squeeze out the bread and add to the pine-nuts with the eggs. Process until smooth. With the motor running, slowly add the olive oil. Then add the vinegar, salt and 1 cup of cold water. Pour the mixture into a bowl or pitcher and add 1 cup more of cold water. Chill the gazpacho. Add melon balls or chopped pear or apple to each serving. Garnish with croutons of bread fried in olive oil. Some foods, especially eggs, really should be served hot out of the pan. Others taste just as good after setting a few hours. The Spanish tortilla is the perfect example of a cooked dish that can wait. Tortilla with peas, favas and potatoes. Lunch or tapa. Cooked in advance, the tortilla sets on the bar at room temperature, ready to be cut into tapa portions. Or, it’s packed in a hamper for a picnic or road trip. 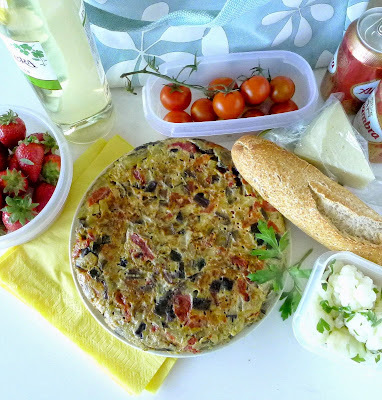 In the days before high-speed rail travel, anybody going on a long train journey surely packed a tortilla for an afternoon merienda. 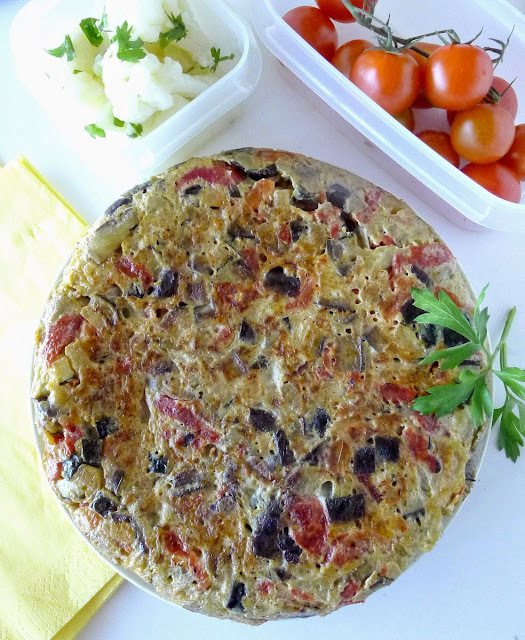 Tortilla with eggplant, zucchini and roasted peppers--ready to roll. 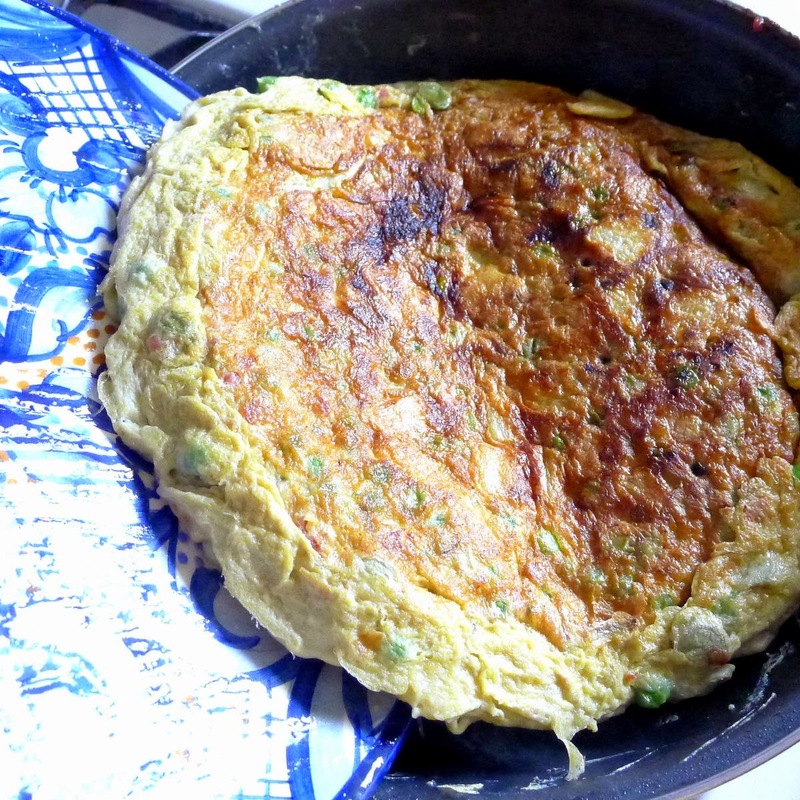 The classic tortilla—I don’t call it an omelette—is just eggs, potatoes, sometimes onion and, of course, olive oil. (recipe is here). But all sorts of vegetables can be incorporated in the egg mix. 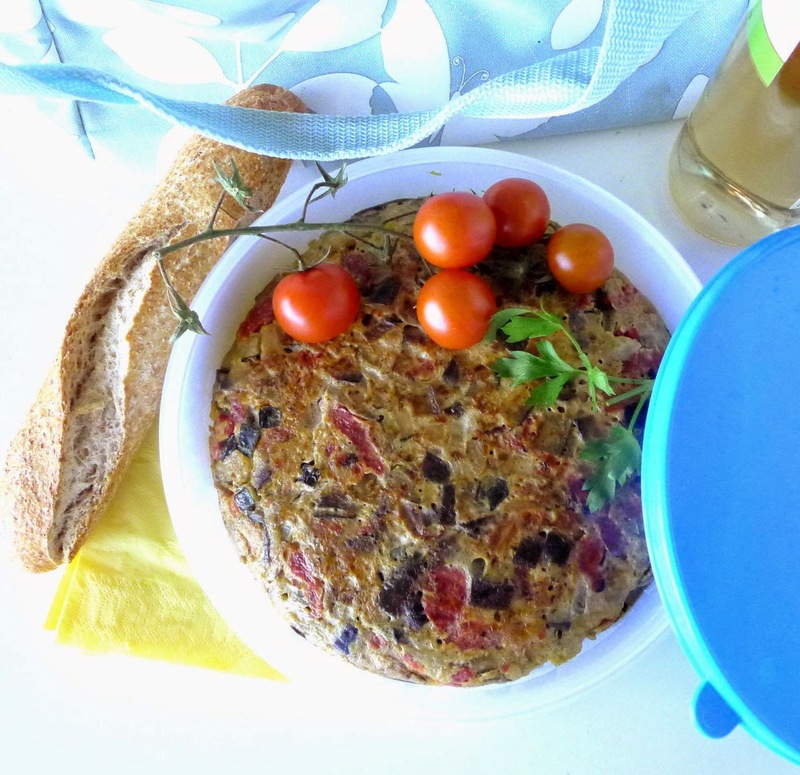 The tortilla can be served for lunch, snack (kids love it), tapa, supper or, hey, even breakfast. A tortilla that’s going to be eaten immediately is usually cooked so it’s still a little juicy in the center. But tortilla that’s going to be packed to go should be thoroughly cooked through. 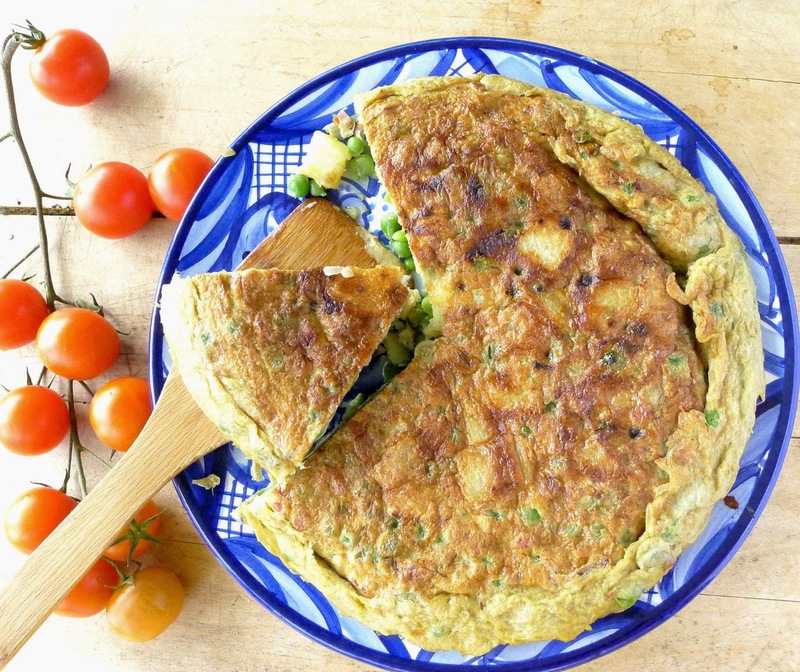 You can make tortilla a day before it’s going to be eaten and refrigerate overnight. Allow it to come to room temperature before serving. Tortilla with fava beans and a dollop of alioli garlic sauce. Traditionalists don’t serve tortilla with anything but bread. But, you might enjoy it with a sauce, such as alioli, garlic mayonnaise. I like a few drops of Tabasco. My kids always liked ketchup. Fava beans and peas from my garden were the inspiration for this tortilla that also includes potatoes. The potatoes should be tender before incorporating them into the eggs and they take a while to cook. Use lots of olive oil—the potatoes absorb very little oil, but it helps them cook quickly without browning. You don’t want crisp potatoes for tortilla. Cut the potatoes into ½-inch dice. Heat the oil in a 10-inch skillet. Add the potatoes. Lower the heat to medium and fry the potatoes, turning them in the oil so they cook evenly. 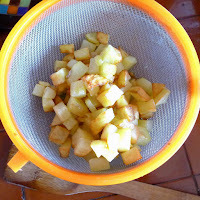 Cook potatoes, without letting them brown, until they are tender, about 15 minutes. Drain off the cooking oil. Place a heatproof strainer over a heatproof bowl. Carefully pour the oil and potatoes into the strainer, letting the oil drain into the bowl. Reserve the oil. While potatoes are frying, blanch the fava beans in boiling water and drain. Blanch the peas in boiling water and drain. Add 1 tablespoon of the reserved oil to the skillet. Sauté the ham, onion and garlic for 1 minute. Add the fava beans and sauté for 3 minutes. Add the peas and sauté for 2 minutes more. Mix vegetables into beaten eggs. Beat the eggs in a bowl with the salt. 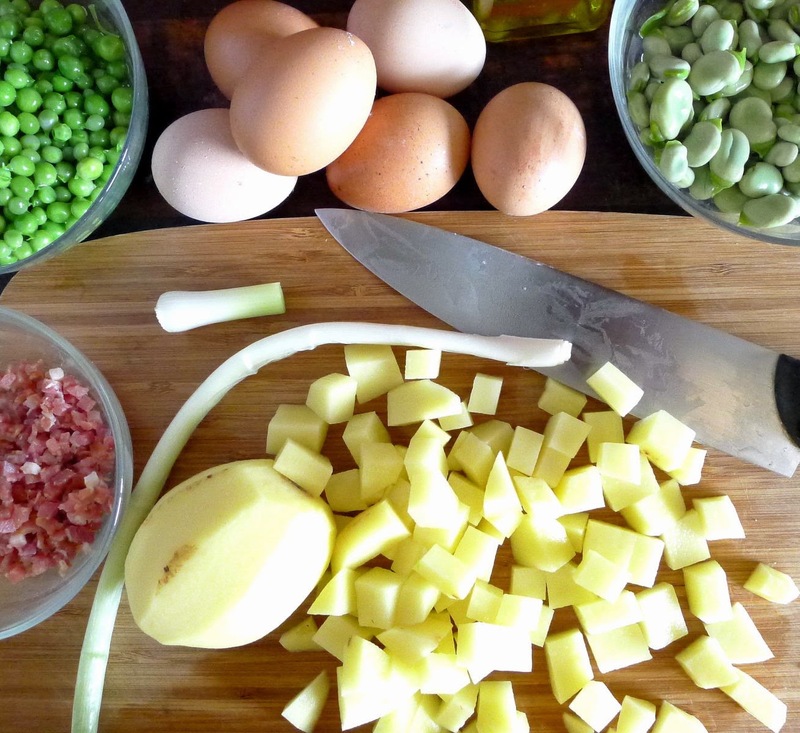 Stir the fried potatoes into the eggs. 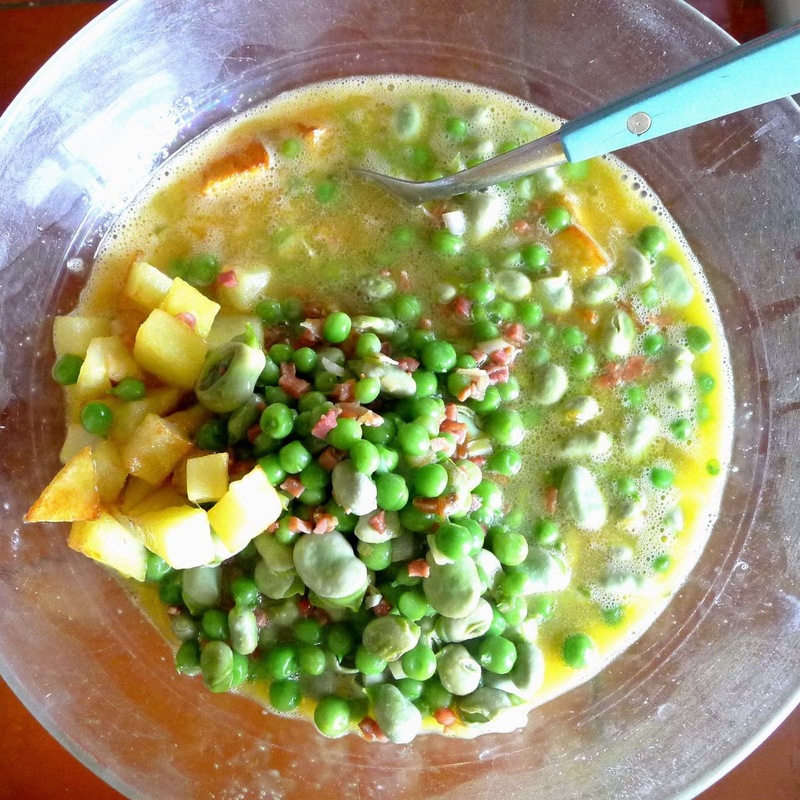 Stir the favas and peas into the eggs. Heat 1 tablespoon of oil in the skillet. Pour in the eggs and vegetables. Lower heat to medium and let the tortilla set on the bottom without browning. Don’t stir the eggs. Use a heatproof spatula to firm the edges of the tortilla. When the egg is almost set, remove the skillet from the heat. Place a flat plate or pan lid on top of the tortilla and, working over a bowl to catch any drips, very carefully reverse the tortilla on to the plate. Slide tortilla back into the skillet. Then, slide the tortilla back into the skillet to cook on the reverse side. Lift the edge of the tortilla with a spatula and carefully slide it out of the skillet onto a serving dish. Strain the remaining cooking oil and use it another time. Packed for a picnic. Beach or sierra? 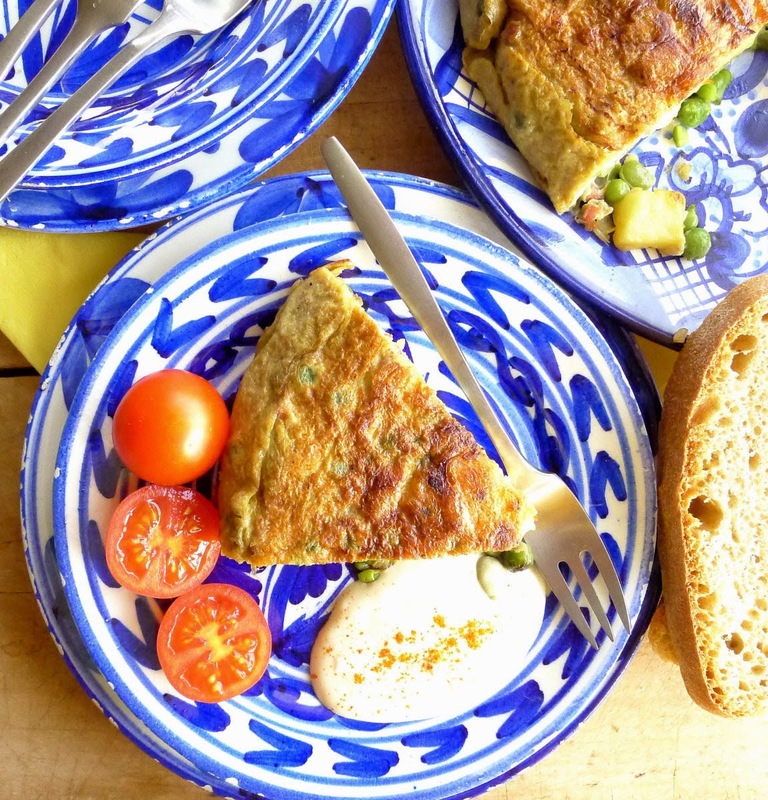 This tortilla is typical of Murcia, which is known for its market gardens. 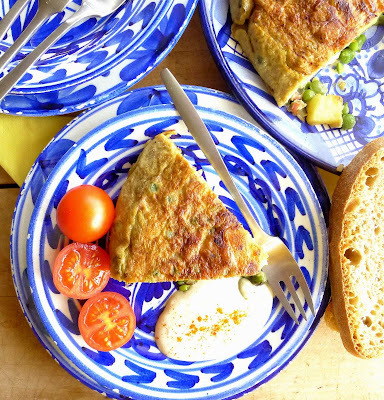 With no potatoes, it’s quicker to prepare than a classic tortilla. 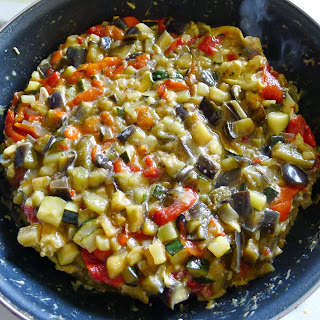 Make it with any combination of eggplant, zucchini and roasted peppers. To save time, I used roasted peppers from the grocery store. Canned ones could be used too. Unlike potatoes, which absorb very little olive oil while cooking, eggplant absorbs a lot. A smaller quantity of oil is needed for this recipe. On a high heat, heat 2 tablespoons of the oil in a skillet. Add the onion and eggplant and fry, turning, until eggplant is lightly browned, about 4 minutes. Lower heat and add the zucchini. Sauté 3 minutes more. Add the tomato pulp and strips of red pepper. Season with 1 teaspoon salt, oregano and red pepper flakes, if using. Cook until vegetables are soft and most of the liquid has cooked away, about 10 minutes. Carefully ladle the vegetables into a strainer and allow to drain for 5 minutes. (Save the liquid for another use.) Wipe out the skillet. Beat the eggs and ½ teaspoon salt in a bowl. Mix the fried eggplant mixture into the eggs. Cook eggs and vegetables until eggs are set. Heat 1 tablespoon of the remaining oil and pour in the egg and vegetable mixture. Turn the heat down to medium and let the tortilla cook until set, about 10 minutes. Use the back of a spatula to firm the sides. Shake the skillet occasionally to make sure the tortilla is not sticking on the bottom. Working over a bowl to catch any drips, place a flat plate or pan lid on top of the tortilla and, very carefully, reverse the skillet to turn the tortilla onto the plate. Add remaining 1 tablespoon of oil to the skillet and slide the tortilla back into the pan to cook the reverse side, about 3 minutes. Use the spatula to lift the edge of the tortilla and slide it out of the pan onto a serving plate. Pack a picnic basket and we're off! The tomato seedlings were becoming leggy, past time to plant them out in the garden. Forced by circumstances to make room in the garden, I pulled out all the kale and chard from the winter garden, washed, blanched and bagged them for freezing. Then I looked in the freezer. I found a couple bags of last year’s fava beans and I’m picking fresh ones now and may freeze the surplus. Still have lots of green beans, which is fine, because new crop is more than a month away. And, what’s this? A hunk of stewing beef stashed in the freezer for an intended beef stock. 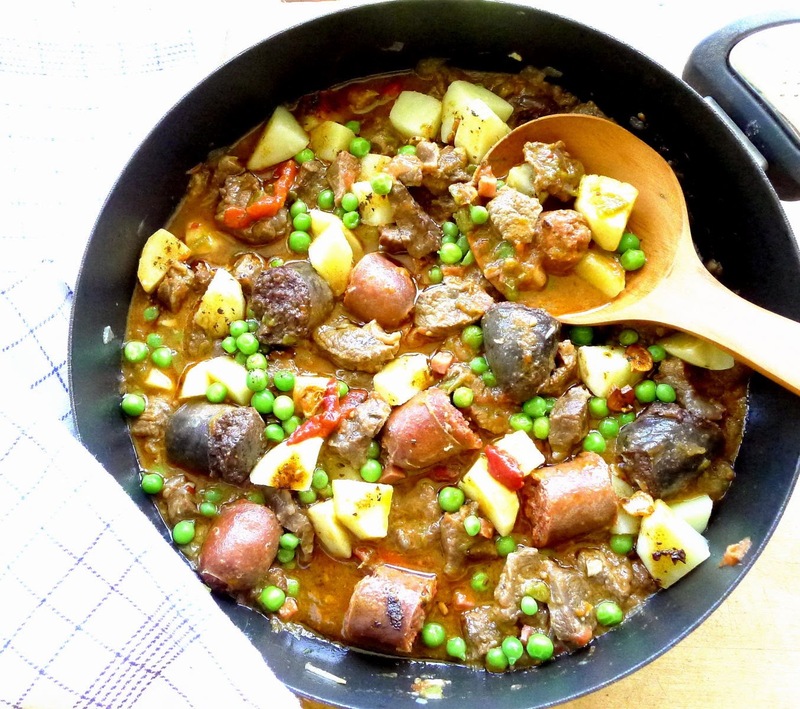 Slow-cooked chunks of beef and two kinds of sausages in this stew. 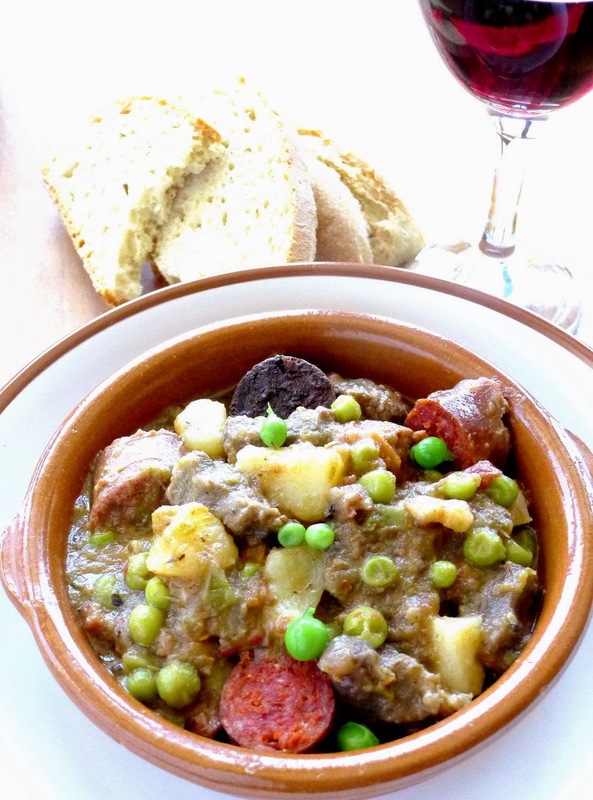 Stew served as a tapa. It’s definitely time to finish the stewing season, before hot weather arrives, so I’m making a rustic beef stew from Toledo, with the curious name of carcamusas. 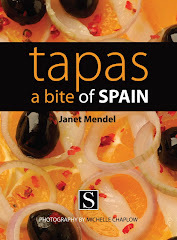 Supposedly the name was invented in a bar in Toledo, where the stew is still a favorite tapa dish. Morcillo is beef shin, a cut full of flavor, but needing long, slow cooking to tenderize it (morcilla is blood sausage, used in this stew). The stew improves if prepared a day in advance and reheated. You can, if desired, skim off the fat that congeals on top. 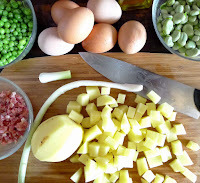 Cook the potatoes and peas separately and add them to the stew when it is reheated. 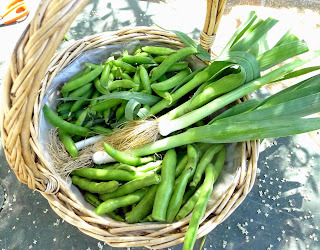 I'm using fresh peas from the garden for this stew, but the peas will soon give way to pepper plants. And, as I set out those little tomato plants, I'm imagining a surplus so that I can freeze some for the next stew season. 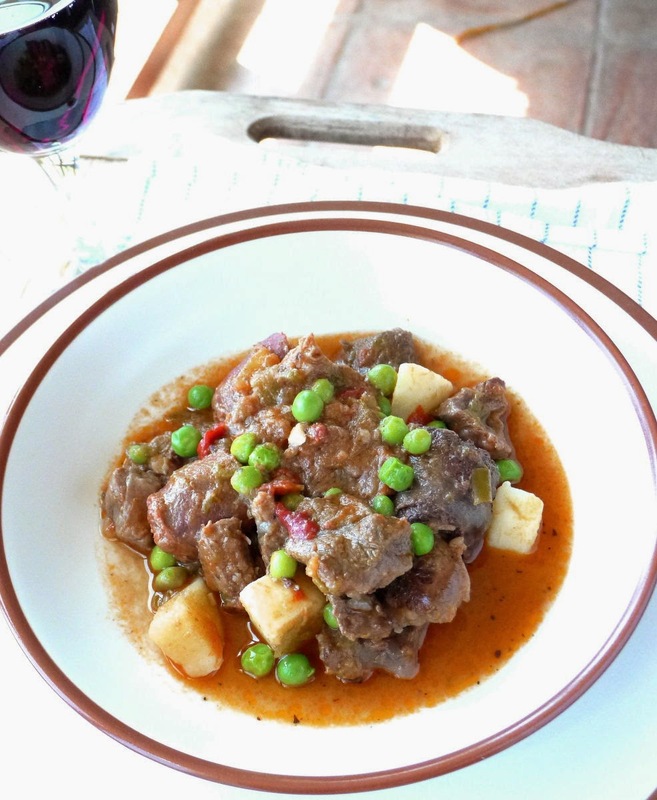 Fresh peas add a touch of spring to this beef stew. Cut the beef into 1-inch cubes. Heat 3 tablespoons of oil in a heavy pan over high heat. When oil is smoking, add the beef. Allow it to brown on one side, 2 minutes, then turn the meat. Add the green pepper, onion, and chopped garlic. Fry on high heat 3 minutes. Add the tomatoes and fry 2 minutes. Add the wine and 1 cup of water. Season with peppercorns, salt, and bay leaf. Bring to a boil, cover, and reduce heat so the stew just simmers. Cook 1 hour. Add the ham, chorizo, and morcilla, if using. Bring again to a boil, reduce heat, and simmer until beef is very tender, about 45 minutes more. Add the peas, strips of pimiento and potatoes. Cook, uncovered, 10 minutes. Heat the remaining 1 tablespoon of oil in a small skillet. Add the sliced garlic, red pepper flakes, and oregano and fry until garlic is golden. Remove the skillet from the heat and stir in the pimentón plus 3 tablespoons of liquid from the stew. Slice the chorizo and morcilla (kitchen shears work well). Serve the stew, sausage, and cooked potatoes with the fried garlic mixture drizzled on top. 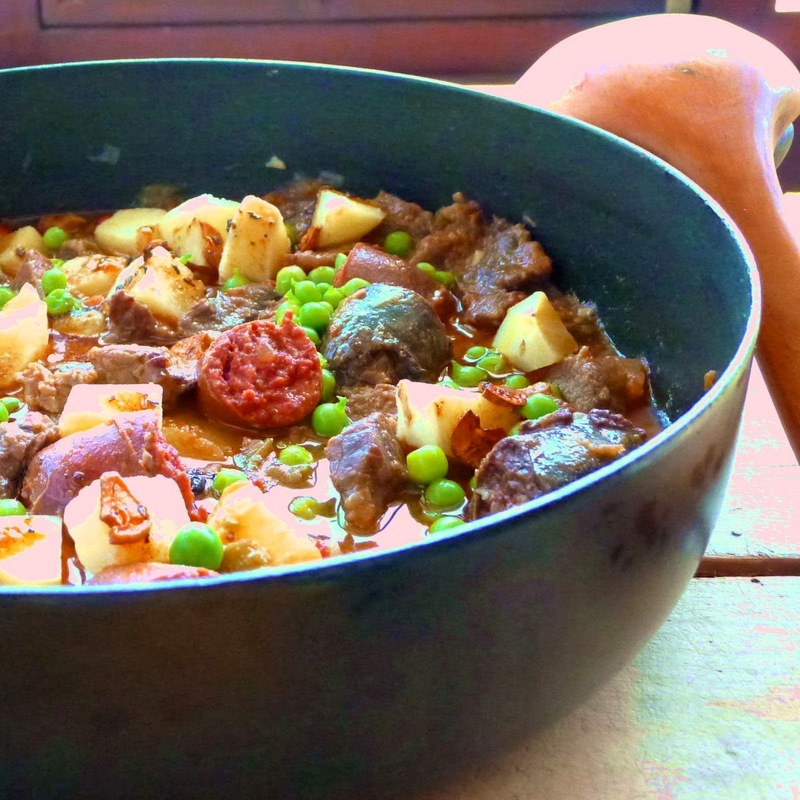 A glass of robust red wine goes best with this rustic stew.